This entry was posted on May 9, 2013 by admin. 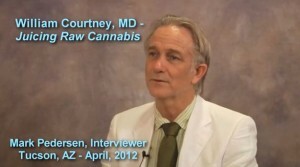 Interview during Seventh National Clinical Conference on Cannabis Therapeutics in Tucson, AZ, April 2012. Dr. Courtney, a physician in California, explains why juicing raw cannabis accesses more cannabinoids and other phyto-compounds than heated cannabis. Interview conducted by Mark Pedersen for Patients Out of Time, hosts of the conference.